If there’s such a thing as a comprehensive cultural map of the world, it’s woven on to something very like this. No opportunity to comment on it right now — but I’m confident it will spark some responses. The connection between Mithraism and Christianity in the picture is false (or at best not worth mentioning). Also strange that they don’t show the Orthodox splitting off. They clearly show the catholic split-off, so I think that suffices if we simply consider “Christianity” to stand for “Orthodoxy” as well. I don’t think that Constantine’s cross is a fitting symbol for them, though. It should be more of an orthodox emblem. There may be some confusion between (genuine Persian) Mithraism and “Mediterranean Mithraism”, which has practically nothing to do with the Persian version except for the name. The Mediterranean version was what was popular in the Roman army. The question of how heavily it influenced Christianity is still being contested (at least as of 10 years ago). Yeah and Sunni and Shia too. Cool diagram though. I can appreciate the effort, but I also have a bunch of disagreements where I think the chart is wrong. Heuristics mentioned that the Mithraism link is false and Orthodox is missing. I’ll add that Judaism is misdated, because 900BC (not BCE!) is *after* the Kingdom of Israel, and that isn’t even close to the start – we have records of Jews going back to 1500BC. Which incidentally makes the Atenism connection highly questionable. African Animism seems to appear out of nowhere 1550AD with its only sources being influence from Catholicism/Protestantism. This seems to be a drawing error – its brown color should be connected to the brown animism stems further down. The American things listed as offshoots deserve a polytheist root somewhere too. If you want to see a religion appearing out of nowhere, break up the solid column from Canaanite polytheism to Judaism. From the word go (or rather, from the word genesis), Judaism is denouncing polytheism. In the beginning YHWH made the light and the darkness, the sun and the moon, the sea and the sky, the water and the land, the birds and the fishes, the trees and the flowers. Implying: The light and the darkness, the sun and the moon, the sea and the sky, the water and the land, the birds and the fishes, the trees and the flowers are not gods, they are created things that YHWH made in a day and can destroy in a day, deserving no worship. Rosicrucianism is listed with no links to Christianity. Islam is listed as a branch of Judaism with no influence from Christianity. Absurd. Christianity should have “influence” links pointing to a lot of the top of the graph 1000AD, but that may be impractical. In some places, though, the influence is arguably stronger than the entry itself – what is the 1870 entry for “Heathenism”? The pussified neo-norse fags who complain about neo-nazis are mock-Christians more than they are descendants in any way of the men of the blood eagle and the sacrificial noose. To add to that, I am not finding Tengrism on that chart. Your arguments about Judaism appearing ex nihilo are a little historically off. Both external evidence of archaeology and inscriptions and the internal evidence of the Hebrew scriptures themselves suggest that strict monotheism doesn’t emerge until around the time of the exile. Pretty much the entire narrative of the Hebrew scriptures consists of the Israelites worshiping Baals and Asheroth, including having those shrines within the Temple itself, and the prophets telling them to knock it off, with limited success. If one looks at this descriptively rather than prescriptively, this describes a henotheistic or de facto polytheistic situation in which the cult of YHVH mingles freely with the other ancient Canaanite cults, and in which the strict monotheistic strand is a minority position which only became dominant after the exile. Of course we’re accustomed to viewing this through the lens of the post-exilic priests and prophets, under which interpretation only the cult of YHVH was ever “Judaism”, the other cults being Canaanite pollutions. But I don’t think that’s what it actually looked like on the ground in 1000BC, for example. I side with Lewis that the “internal evidence of the Hebrew scriptures” is largely an alleged sighting of fern-seed by men who can’t see an elephant at ten yards. But even supposing that the early Israelites were putting up giant woodies to fertility deities all over the place, it still belongs earlier – at least 1500BC, when judges and prophets went around complaining about that sort of thing, and likely closer to 2000BC. I’m not so much saying it’s wrong as inconsistent: moving Judaism back is one resolution, thinning the connection to the late version is another, the way the European polytheisms have only thin lines to their new relatives. I think we can agree that Yahwite monotheism (what we now think of as Judaism) existed long before 900BC, so we don’t disagree there. My argument is a little more nuanced: if we interpret “Judaism” in this strict sense, then most Israelites were not observant Jews until after the exile, but were rather Canaanite pagans or syncretists. Again, the Hebrew scriptures themselves attest to this. Putting it into the normal Biblical language, we would say that idolatry was rampant, indeed normal for most of the history of Israel. Not to nitpick, but Genesis does not say YHWH “made the light and darkness” etc. It starts “B’reshit barah elohim hashamayim v’ha’eretz…” I.e., “Elohim,” which some want to translate literally as “the gods” (though it is accurate to say that it is an Hebrew honorary plural, given the singular verb). I’m an Orthodox monk, currently converting to Catholicism. It is fair to say that Orthodoxy is not a continuation of plain ol’ Christianity, as some have said in the thread. The Palamite controversy, when the Eastern Churches first began to develop a truly distinct identity (based primarily on anti-Latin sentiment), really marked a true theological departure from her earlier theological roots into an Aristotelian-inspired new doctrine about “energies” of God having a quasi enhypostatic existence unto themselves. Prior Fathers had mentioned “energies” (or “operations,” in the West), but they were never understood as enhypostatically existing things; they were understood as actions of the Trinity. The teachings of the earlier Greek Fathers on deification, from St. Athanasios to St. Gregory Nazianzen to St. Maximos, was almost identical to the teaching on deification in the Western Churches: deification by analogy and by participation and imitation. The development was hotly contested even in Orthodoxy. Even then, an Ecumenical Synod obtained the full agreement of the Eastern Patriarchs and Bishops with Rome (minus one man only), before this reunion was itself repudiated in the 15th century… making the Orthodox Church older than the Protestant bodies by but a few years. Anyone who studies the first 4 centuries of the Church, and the rights of the Patriarchates and Metropoltanates compared to that of Rome, will see that Christianity from the very beginning, even pre-Constantine, saw Rome’s bishop as succeeding to the authoritative preeminence of St. Peter amongst the Apostolic choir (later, the choir of bishops), with an authority that was over the other Patriarchates, not amongst them. The original three Patriarchates were all viewed as “Petrine” sees, Rome being chief, because Peter had personally presided on the throne of Antioch, and sent his disciple to be bishop in Alexandria, before dying while presiding at Rome. The elevation of Constantinople (and Jerusalem) to Patriarchal rank was rejected by Rome precisely because it upset this ancient system, and the canons effecting this exaltation were actually nullified by Pope St. Leo the Great – an act, which was accepted by the Patriarch of Constantinople at the time (Tarasios), and by all the Churches of the East, as confirmed by the correspondence between them and the Pope immediately following the council (one only has to read the tone of their letter, to see that they understood the Pope’s position in fundamentally the same terms as a modern Catholic would). It was Constantinople’s political ambitions over the next centuries, in the face of the Roman authority that had definitively resisted this pretense, that eventually provoked the crisis point resulting in the schism. Things like the Filioque, which were only brought up as a deflection when Rome was seeing to matters in the Eastern Churches, had already been explained and defended by Greek Saints like Maximos the Confessor; the schism was entirely about Constantinopolitan politics – other things are mere excuses. The bishops of Rome routinely deposed Patriarchs and Metropolitans even in the Eastern Churches, or sent their own legates and vicars to the Eastern Churches with a supreme authority, in the first centuries of the Church. The only thing obscuring this witness, is the growing hostility of Constantinople, and the growing acquiescence of the other Patriarchates still under direct Imperial control, as the centuries rolled on. But the early and pristine doctrine of the Christian Faith is there, for those who want to see it. Sorry to go into such detail, but it seemed germane to the discussion of the Catholic/Orthodox split, that some have mentioned. I agree the Orthodox should be noted on the chart. Unless somebody can demonstrate that Christianity prior to 440 AD was somehow not Catholic, I don’t see the point in drawing a distinction. That was the year the aforementioned Pope St. Leo the Great was elected Pope, and began his fight against Monophysitism. But this seems an arbitrary starting point for a separate entity called “Catholicism.” Why not Nicaea? Why not the council of Sardica? Why not the Papacy of Clement I? The implied claim that Orthodoxy brought in Aristotelian-energies and that was and remained a deviation from Catholicism, well Edward Feser might disagree. As would Michael Cronin, who at the time he wrote “The Science of Ethics” (1930), was basically just expressing the long-held Catholic position on this (pre-Vat III/pre-converstion-to-Kantian-Rawlsianism). Which was Aristotelian through-and-through, top to bottom. If anything, Orthodoxy was more inclined to Platonic/NeoPlatonic influences than Aristotelian ones. I get that the Catholic Church has had to conduct ongoing Donation-of-Constantine type revisionist history – all the moreso post Vat II. But it doesn’t mean it’s. . .unproblematic from a factual-content point of view. As for my part, I’m hoping Foseti will reply to the inquiries about what he finds dispiriting about the latest wave of NRx. Preferably in a post on his blog. (As for my part, the main dispiriting thing is that it has caused people like Foseti to stop expressing their brand of NRx. Or at least grow much quieter. When really yes, the diffusion is almost predictable; a lot of people adopting the label are keeping only dirty bathwater, while tossing the baby out the window. Still, people like Foseti were always up against a machine too strong, that didn’t discourage their writing before). If something essentially is missing from most of the newer NRx stuff – and it is (and that’s not just a relative shift in tone to a more confrontational/red-meat tone, and away from a rhetorical strategy designed not to turn off anyone who isn’t already in the fold), then the thing to do is to reassert and reexpress the things that are being junked. Well, I’m coming at it from the perspective of an Orthodox monk, who had absolutely no reason to do “revisionist” scholarship. Rather, my sources (on Theosis and Palamism, specifically) were mostly Orthodox – Meyendorff, Bogdan Bucur, Norman Russell, Constantine Tsirpanlis, etc. 10 years ago, when I was a Protestant coming to the Orthodox Church, I could only speak English and a few Romance languages, and so my research options were limited to such things – including the Eerdman’s translations of the Ecumenical Synods. 10 years later, with four years of monastic formation and 8 years of Greek and Latin study, I was buried neck-deep in the Greek acts of the Ecumenical Councils, and of course the Greek and Latin Fathers. I had every intention of remaining loyal to my Orthodox confession, and was hardly looking for Catholicism. Nevertheless, my research into the hesychast controversy, as well as my research in to the Immaculate Conception and the Papal Primacy, in Eastern and Western sources, has led me to the conclusion that the Catholic Church actually is in the right on these issues. As to the Donation of Constantine, that bit of fluff was used to advance claims of political supremacy in Italy, but none of the theological claims of Catholicism rest on it at all. As to Aristotelianism as the inspiration for Palamas’ energies, I will apologize. I misspoke. I will point out that Palamas studied Aristotle with Theodoros Metochites, defended the legitimacy of theologizing via “apodeictic syllogism” (a la Scholasticism) and was acknowledged by Metropolitan Methodios Fouyas, together with Palamite scholar Trispanlis, to be “methodically an Aristotelian.” Still, he was at heart a Platonist, and what I had meant to say, was that Palamas’ energies were necessitated by a rather naked (and pre-Christian) Platonism. The Church has adopted Platonic and Aristotelian philosophy and terms from time to time, of course, but never whole-cloth. They have always been altered to fit Christian theology. In this case, Palamas’ energies arise from over-stressing some elements of Platonism in his theology of theosis. First, he stresses that if anything is a being other than God, then God Himself is not a being (in the 78th of his 150 Chapters, taken straight out of Plato’s Parmenides). Second, in describing existence as tripartite – imparticipable, participated and participating – he is essentially following Proclus, somewhat through St. Dionysus. Then, he regards participation as perfectly “enitative” (i.e., to participate in something is to become entirely one with that thing *by nature*). Palamas’ reasoning was that “any part of a substance, even the smallest, contains all of its powers,” and thus “if indeed we participate in the substance of God, we are omnipotent.” And, by syllogism, “a substance therefore has as many hypostases as it has participants” (ibid, 108, 109). Finally, because of all this, Palamas had to develop a “middle level” of being between the authypostatic (self-subsisting) and the anhypostatic (having no independent self-subsistence): the “enhypostatic,” a place where God could put some of His divine nature, but at one step removed from Himself, and where it could be subject to creaturely participation and perception, but in a way that both transcends this creaturely participation and manages not to rise to participation in His own truly self-substantial life. But in the Greek Fathers before him, including Ss. Maximos (the Confessor), Gregory Nazianzen and Athanasios (authors who spoke most about deification), this thorough endorsement of these Platonic categories is entirely absent from their treatment of deification. And in fact, their discussion of deification is along exactly the same lines as the Latin Fathers – pariticipation along the lines of the analogia entis and imitation, and an enjoyment of the supernatural effects of grace operating directly upon the creature (resulting eventually in the Scholastic concept of “created grace,” not because the grace is itself created, but because its fruits in a created soul must exist as effects from a cause, and thus, so far as the creature participates in the grace along these creaturely lines, the grace which is itself uncreated is called “created grace” when it is described as being participated by a creature). For this reason, it was not merely “Westerners” like Barlaam, but many committed Orthodox thinkers in the East, who regarded Palamas’ view as a genuine innovation even in the context of Greek Patristics. Jeffrey D. Finch observes that “the refusal to include causality in the doctrine of grace is a truncation of the Eastern Patristic teaching at best,” and goes on to summarize Russian Jesuit Gerhad Podskalky’s view thusly: “Palamas needed recourse to, and indeed did propose, this real distinction because he first mistakenly gave a Neoploatonic, emanationist construction to Pseudo-Dionysius, who in fact had emphasized repeatedly that the differentiation of God’s powers from his unknowable essence did not mean that truth, life, light, etc., were something other than being, but rather, that this differentiation only represents the attempt on our part to articulate the incomprehensible.” Any student of the history at the time, will quickly see that Palamism’s triumph was not due to any of the Synods’ sober, profoundly-considered affirmations of an authentically Greek Patristic Tradition, but was entirely due to Imperial politics at the time, and the inter-necine warfare between dueling Byzantine parties. Since you’re converting from Orthodoxy to Catholicism, it might be interesting to hear your take on this question: What’s the difference between the current Pope and a Postmillenialist Progressive? You’d have to tell me exactly what a “Postmillenialist Progressive” is, for me to answer that. I would imagine that opposition to gay marriage and abortion, a belief in the devil, and the willingness to self-identify as “a son of the Church” are all things they would not have in common. The Church is in crisis. This is the great Apostasy. If it weren’t for Fatima, I would not be converting, because otherwise I would not be able to take modern Catholicism seriously. Insofar as its modernist expression goes, including the recent string of (probably) well-meaning but theologically and traditionally impoverished Popes, I don’t take it seriously. But as the Church Christ founded, She has still not officially defected from the faith. The Popes have made private, personal errors. They have shepherded the Church badly, to disastrous effect. Probably this is the end (but maybe not). But for all that, she remains what she has always been: the very Church instituted by Christ. As St. Catherine of Siena said, she could trust God to preserve the essential element of the Church, even if Satan himself were the Pope. My nitpicking above takes the overall legitimacy of the chart for granted, implicitly ceding the frame. 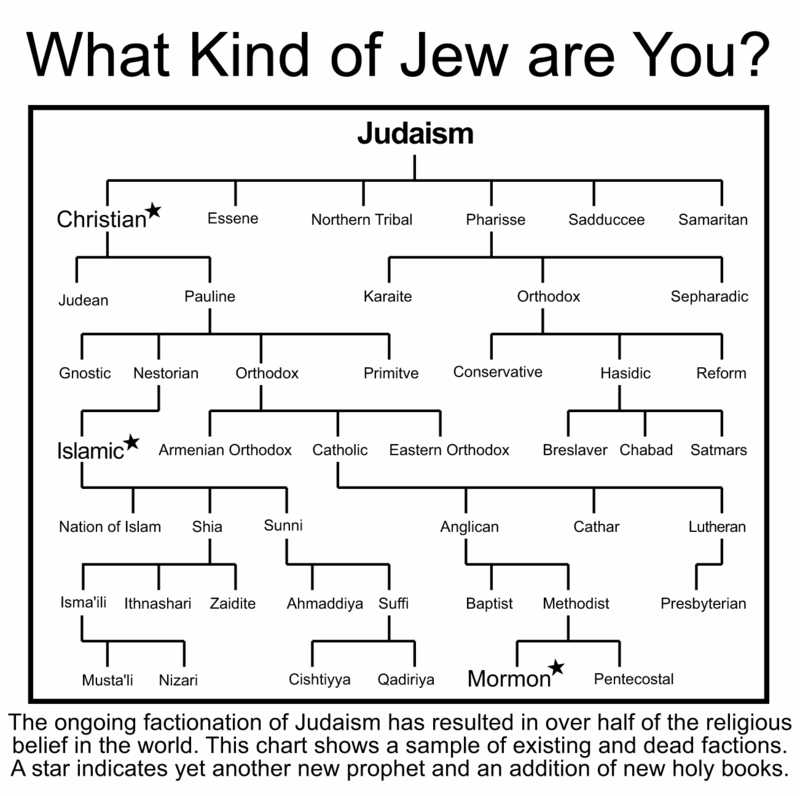 That’s Judaism splitting into Christian, Essence, Northern Tribal, Pharisee, Sadducee, and Samaritan, followed by Pharisee splitting into Karaite, Orthodox, and Sephardic, with Orthodox Pharisaical Judaism splitting into Conservative, Hasidic, and Reform, after which Hasidic split into Breslaver, Chabad, and Satmars. Christianity, of course, has its own tree, which takes up most of the graph. You could squish together most of Peter A. Taylor’s graph into about four items: “Pantheists”, “Animists”, “Polytheists” and “Mystics”, then use the Judaism chart to fill the space instead. Contrariwise, you could take some other branch like voodoo and chart the appearance of Baron Samedi, Ogbu, Papa Legba, Ezili[e] Danto[r], Ogo[u]n, Oshun, and their development in the pantheon over time (Samedi wears a tuxedo), along with some interesting historical tidbits like ESR’s comments on The Devil In Haiti. And to bring the conversation back home to Xenosystems: Nikolai Fyodorovich Fyodorov, Christian mystic and precursor to large parts of the extropian, transhumanist and singularity movements. Be careful about making any arguments about religion based on cladograms, lest you get “The Rapture of the Nerds” thrown back in your face as a descendant of Cosmism. This guy sounds like the 19th century version of Anissimov. Yes. I still think that “horizontal gene transfer” makes any attempt at a religious cladogram into an exercise in frustration. Please don’t shoot me, I’m just the messenger. One of my heretical Christian friends says that there’s no such thing as a non-hyphenated Christian. The differences within Christianity are as important as the differences between Christianity and other religions. I don’t mean to shoot at all. I’m speculating about alternate ways of graphing religion. As a traditionalist Christian, yes and no – there’s a very large and sliding scale of what is important and what is ‘within’ Christianity. Between those two you have a lot of things like the arguments for credobaptism or pedobaptism, which are differences within Christianity of some importance, but it’s hard to get a measuring stick for this, in part because the whole thing goes meta with differences over the importance of a subject. But mostly no – more when I get time, or if Nick prompts me. The chart is too clean. There’s not enough hybridization. Neoplatonism informed both Christianity and Cabbalistic Judaism, Bogomilism and Catharism and all the modern heathenisms were heavily influenced by Christianity, Protestantism had a judaistic tinge, etc. True, we Jews strayed from our Covenant back then, but that does not change what Judaism was just as the fact that we Jews stray from our Covenant today does not change Judaism’s essence today. In any case, Erik is rather close to the mark – Judaism seems to have appeared out of nowhere – and far earlier than the diagram suggests. That Jewish communities exhibited the trappings of cultures with which they intermingled does not substantially deteriorate the extraordinary essence of Judaism: monotheism. Even suggesting (as this diagram does) that Judaism was impacted by Canaanite polytheism in the same way that the latter was impacted by Mesopotamian polytheism or that gnosticism impacted bogomilism is laughable on its face. Judaism was an extraordinary revolution in understanding man, society, and the divine. By some accounts the very concept of time was conjured by the first Hebrew prophets. Judaism remains the only religion to claim universal national revelation. About 57% of the world’s human population now subscribes to religions that claim spiritual descent from Judaism. Then again, I’m biased as I happen to believe that Mount Sinai, um, happened. The Religious ‘Gold Standard’. Is the religion in question: Golden Rule Compliant? And that folks, is how you compare religions. r/badhistory didn’t like this at all.